Chef Nick Leahy, of newly-opened Provencal restaurant Aix, brings his heritage and experiences growing up cooking with his mother and later traveling the world to the kitchen, where he expertly crafts dishes that highlight the quality of fresh ingredients without too much complexity. 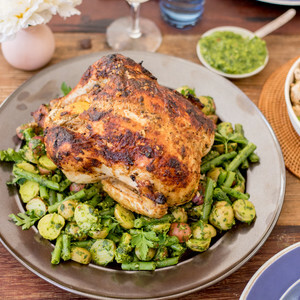 This dish is an excellent example of those sentiments: whole chicken from Springer Mountain Farms is painted with a mixture of Greek yogurt and fresh herbs before taking a turn in the oven to cook until savory and fragrant. It’s paired with buttery new potatoes and crisp snap beans, perfect for late spring. The whole dish is drizzled with a flavorful kale pistou to add decadence to each bite.